· The first in a two-part series that follows the process of bringing Ford’s iconic pony car, Mustang, to the Monster Energy NASCAR Cup Series. 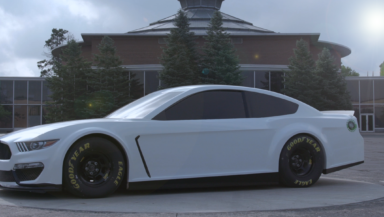 · Titled, “The Responsibility”, the first video highlights the Ford designers and engineers behind the 2019 NASCAR Ford Mustang who developed the next high-performance race car worthy of the Mustang heritage. One of the key parts of the development process for the new NASCAR Cup Mustang was pairing the Ford Design Center with Ford Performance motorsports aero specialists to create a look for the Mustang that was true to its heritage, but also competitive for race competition. Team members met on a daily basis for months to get the NASCAR Mustang’s design to where it is today, ready to debut at Daytona. Featuring Solomon Song, Design Manager, Ford Performance, Stavros Melabiotis, Senior Designer, Ford Performance and Tommy Joseph, Aerodynamics Supervisor, Ford Performance with imagery of the design process from clay, to CAD, to aero work. Runs approximately 1 minute and 55 seconds. Ford’s racing program is part of the Ford Performance organization based in Dearborn, Mich. It is responsible for major racing operations globally, including NASCAR (Monster Energy Cup Series, XFINITY Series, Camping World Truck Series), IMSA WeatherTech SportsCar Championship, FIA World Endurance Championship, Chinese Touring Car Championship, Formula Drift, Formula Ford (Formula Four), and NHRA Funny Car and sportsman drag racing. In addition. The organization also oversees the development and marketing of Ford’s racing engines and performance parts, as well as the outreach programs with all Ford Clubs and Ford enthusiasts. For more information regarding Ford racing’s activities, please visit www.fordperformance.com, www.facebook/FordPerformance, Ford Performance on Instagram and @FordPerformance on Twitter. Ford Motor Company is a global company based in Dearborn, Michigan. The company designs, manufactures, markets and services a full line of Ford cars, trucks, SUVs, electrified vehicles and Lincoln luxury vehicles, provides financial services through Ford Motor Credit Company and is pursuing leadership positions in electrification, autonomous vehicles and mobility solutions. Ford employs approximately 202,000 people worldwide. For more information regarding Ford, its products and Ford Motor Credit Company, please visit www.corporate.ford.com.